You may have noticed that it’s been quiet from this end of late — I’ve had some high priority projects at work sucking my time, plus we’ve been getting ready for a little vacation. On the vacation now we are (did you appreciate that little call-out to Star Wars in honor of 5/4) (even though I’m still working in the mornings 🙁 ), so I thought I would bring you up to date with my thoughts… plus I think I’m incapable of seeing live entertainment and not writing about it. Every time I come to Vegas I realize how this town has changed from when I was here as a kid in the 1970s. Gone are the headline entertainers and the “dinner show” showrooms; gone are most of the production shows. Gone, in fact, is everything serving the great god of gaming — everything is its own profit center now. Still, when you’re in Vegas, you see shows (and there are a few I want to see, if the price is right). One of the shows we discovered was in town was the end of Jason Alexander’s stint at Harrah’s. Now, I’ve never watched Seinfeld (I’ll repeat that, because you probably don’t believe it — I’ve never watched Seinfeld). However, I am a fan of Mr. Alexander from his work on the stage — he was in a number of Broadway shows, and we saw him give a great performance in The Producers in Los Angeles. We’re also aware of him from his movies — our daughter was a big fan of Dunston Checks In. Given that his show wasn’t that pricy, we went last night. I’m glad we did. It was a very funny show. Jason combined music, musical parody, and great comedy observations to create a hilarious two-hour show. He riffed on a variety of subjects — Seinfeld (of course), hair, relationships, and sitcoms are a few I remember. We just enjoyed the show immensely. 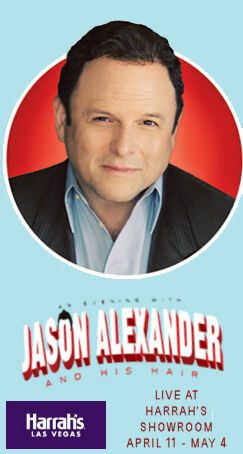 If you get a chance to see Jason Alexander, it is worth it. Dining Notes: Before the show, we ate at Jimmy Buffet’s Margaritaville at the Flamingo. We chose them because they were one of the few restaurants in walking distance with a gluten-free menu. Very good food, and fun entertainment. Upcoming Theatre and Concerts: While in Vegas, we’re also hoping to see Blue Man Group at the Monte Carlo, as well as Evil Dead: The Musical“. Once we return, we’ve got a twofer day: “Hairspray” at Nobel Middle School followed by “The Lion in Winter” at The Colony Theatre (FB). The next weekend brings both “Porgy and Bess” at the Ahmanson and “Cat on a Hot Tin Roof” at REP East (FB). The next two weekends are currently unscheduled: Karen is helping Erin move, and there’s not that much calling to me from Goldstar. June is busy. It starts with a CDF Conference for Karen while I see “The Fantastiks” at Good People Theatre. We lose the following weekend to a Bat Mitzvah. The remainder of the month brings “Stoneface” at the Pasadena Playhouse on June 22, and “I’m Not Just a Comic Genius” at Secret Rose on June 27. July will be busy: “Ghost” at the Pantages (FB) on 7/5, “Return to the Forbidden Planet” at REP East (FB) the weekend of 7/12, “Once” at the Pantages (FB) on 7/19, “Bye Bye Birdie” at Cabrillo Music Theatre (FB) on 7/26, and “Family Planning” at The Colony Theatre (FB) on 8/2. August then remains quiet as we work around vacations and such, but things start to get busy again in September and October. More on that later. As always, I’m keeping my eyes open for interesting productions mentioned on sites such as Bitter-Lemons, and Musicals in LA, as well as productions I see on Goldstar, LA Stage Tix, Plays411.